About 5.5 months ago, my husband and I moved from inner-city Milwaukee back to where I grew up in Michigan after about 15 years away. We aren’t based in my hometown, but we’re near enough to my parents’ home that they’ve shared their garden produce with us all summer. We’re also lucky to be near one of my sisters, who has worked in horticulture for many years and loves growing vegetables, but whose family won’t eat those vegetables—so we get her bounty, too! My parents have had a garden the majority of my life’s summers, and they have a great spot for it. The soil is a deep brown—not too sandy or full of clay, but a lovely texture that holds water well and generally is pretty easy to get a shovel into. I spent the summer after I graduated college in that garden, recuperating my soul and energy level through the methodical work of growing vegetables, soaking up the sun and enjoying the peaceful whisper of plants and bugs. That was the first summer my dad let me take charge of the garden, including the layout, the crops, and what needed to be done. So, having enjoyed the goodies from the garden this past summer, I wanted to try out some new practices that I’ve read and talked about, but never tried. Although I’ve worked for the Biodynamic Association for a little over two years, talking with people weekly about their growing methods and the details of their farms and gardens, I’ve never done much experimentation with biodynamic gardening. Now, there is land and material to try my hand at some new-to-me practices. Up first is the compost pile. 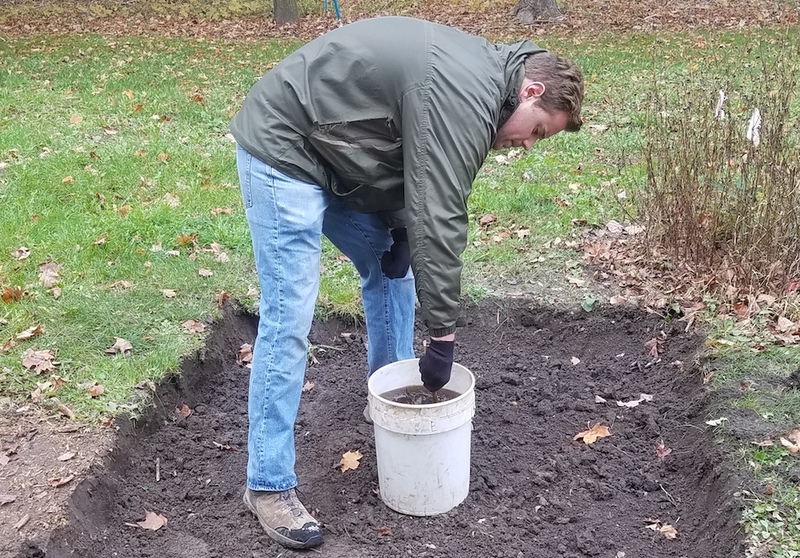 After deciding on the location and building method, and getting our compost starter activated, we gathered the materials for the layers and dug our hole, as advised in the instructional sheet from the Josephine Porter Institute (JPI). My dad has a backhoe, and both he and my husband wanted to just dig the hole with that, but I convinced them that the human power of shovel and muscle was the way to go with our first, small biodynamic compost pile. We’ll see if I get my way on that in the future. Using JPI’s sheet as the basis for our pile, we filled the hole with decaying leaves from the maple trees my dad planted around the garden many years ago that he taps for maple sap each spring. Next came a green matter layer as a substitute for animal matter, gathered from a few food scraps and plants from the garden and other nearby spots. There are nearby neighbors with horses and donkeys, so hopefully next time we’ll think ahead and get some of that manure to help strengthen the compost pile. Then the third layer in the repeating series – a dusting of soil from where we’d dug our hole. We continued these layers until our pile reached around four feet tall, spraying the compost starter prep after each layer addition, and spraying water every few layers. The final, thicker layer of soil capped off what became a beautiful pile and a feeling of great accomplishment. I started out with a pretty full bucket of the diluted compost starter, and about halfway through I was cursing myself a bit for putting in so much water. However, as we worked the layers up, it became apparent to me that by having an abundance of the compost starter, we could bless the rest of the garden with the preparation and “plant the seed,” as it were, for biodynamics to take place in this space. With the compost pile complete, I sprayed the now-winter-prepped garden space with the biodynamic compost starter, as well as a couple compost piles that we’ll work with more in spring. It was really rewarding to work on my first biodynamic gardening effort, and to start to tap into the earthly and atmospheric forces in that space. Despite the garden being in that space for many of the past 30 years, it felt like we were building something new and exciting. In the spring, I hope to spread this first biodynamic compost over my parents’ and sister’s gardens to give new life to those spaces, and will work more with the other compost piles to transition them to biodynamic piles. We’ll plant some new crops next year, and hopefully spread other biodynamic preparations when appropriate. I look forward to learning more about planting calendars and other applications in order to continue transitioning these spaces and my family’s practice of biodynamic gardening. Anna McAvoy-Emrick holds Operations and Finance roles with the Biodynamic Association. If anyone could explain to me how I can access/read this article, it would be greatly appreciated. Hey aumanuel@me.com, please give it another try. We were updating our site mid-day and some of the blog content was temporarily unavailable.